I was reading a local hiking/mountaineering forum recently when I came across this post detailing a very scary incident that happened to a skier at a local resort. And then I learned a new acronym: NARSID. Now I have never heard this acronym before, but I know what it is from experience. As a SAR member I have taken part in tasks searching for people both inside and outside of ski areas; one of those I remember involved searching every tree well in a certain area. This took 6 hours. I’ve also fallen in a tree well myself, in the backcountry, and know the terror of being helpless and upside-down. It seems that tree well deaths are so common that there’s a web site dedicated to raising awareness about these accidents. The site seems to contain quite a bit of data analysis including charts that show the frequency of these accidents broken down by state and province. 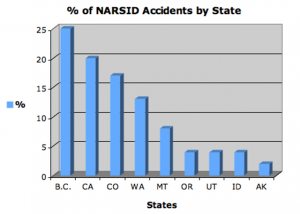 I just wrote about how BC accounts for more SAR tasks than all of the rest of Canada combined, and it seems that BC is also overrepresented with respect to NARSID accidents. There are some problems with the site, however. The first is that there doesn’t seem to be a link to any references for the data sources. A reader could be led to believe that they are all from ski hills in the respective states, but I somehow doubt that ski hills are going to release information on deaths and accidents on their tenures. Without knowing the source of the data you can’t be sure if it is self reported, in which case there will be some self-selection bias, and the possibility of anecdotal data – that is where a contributor unwittingly reports something they saw incorrectly. Without a reputable source, be it a ski hill, or other data-gathering agency, the data is suspect. If the source is an agency or ski hill, which ones reported and which ones did not? If not all are reporting then some state may be under represented, and others over represented. Another problem, with particular reference to the above chart, is that there is no data on the time period for which the data was gathered. Nor is there any mention of the total sample size (i.e. : the number of incidents reported). Finally, it’s not clear whether the “accidents” resulted in deaths, or weather they were anecdotal stories on witnessed events, and “near misses”. Without knowing the above information, the chart is a bit meaningless. Reporting the data in this way is misleading. Without knowing the number of incidents it’s impossible to determine the scope of the problem. Without knowing how the data was gathered it’s impossible to understand the size and distribution of the problem, and without reporting how this relates to other accidents (as I have done here and here) it’s impossible to figure out weather this is worse or better than the background accident rate. The first thing any reader should do when reading a statistic is ask yourself compared to what? At the very least it would be nice to know how these accidents compare to other ski accidents. This would give a picture of how big the problem is, or if it is a problem at all. For a good example of how to compile such statistics, take a look at Avalanche Accidents in Canada volume 4. I understand that the primary purpose of such a site is to educate people to the possibility of such an accident, however if the author is compiling anecdotes, he could either publish them directly or reference his source material to support his argument; the site comes off a bit thin, with the strange acronym and all. Regardless, the recommendations on the site to ski with a buddy and always stay within visual and auditory contact are very valid, and not just for the purposes of avoiding death in a treewell. Recent accidents, including avalanches within the bounds of a ski resort, deaths from hitting trees, and just plain head trauma have highlighted how dangerous skiing in a resort can be. Even if the chance of such an accident are very small, you may as well reduce the hazard a bit by skiing with a buddy and wearing a helmet. Canadian Avalanche Association (CAA) investigates avalanche accidents in Canada and accident reports can be searched here. Avalanche Accidents in Canada Vol4 1984-1996, details several accidents that have happened in bounds. SkiHelmets.org collects and references news reports of skier accidents and deaths in an effort to sell helmets. However, they do not misrepresent where the data comes from. Please read my follow-up article for more information, and a reference for actual meta-study on this accident type.